Last night was an emotional night at the garden. 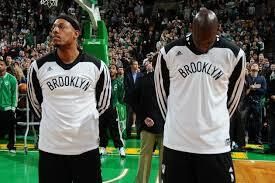 there were tears in the crowd as everyone cried watching the tribute videos for The Truth and KG. There was more wet eyes at the garden then at the primer of Titanic. At first people thought the tears were from season ticket holders weeping that their 4K investment to see a decent basketball team is losing value fast. If the video did any work, it held KG and Pierce to about 8 points total between the 2. The Celtics made a last ditch effort at the end but it wasn’t enough. Rondo did play his best game since being back with nearly a triple double, but the game was on ESPN, of course Rondo will be polishing his stats. Although the Celtics total win count isn’t old enough to drive in Massachusetts, the team isn’t totally bad. They are only loosing by small amounts, which leads to believe they are a stones throw from putting something together. In other news, the Grammy’s and Pro Bowl were on TV Too!! Most Boston people caught the end of the Bowl since it was still on after the C’s game. If you bet on that game on the Over/Under then I hope you picked the under. Usually the over is the way to go, not tonight. It must be the new way of picking teams, or maybe these players realized they want to actually get hurt on a pickup game. And last Ringo and Paul, Mccartney not Pierce, played together at the Grammys. Well Paul played and Ringo pretended. Some say Paul granted a “Make a Wish” for Ringo, I’ll have to agree.